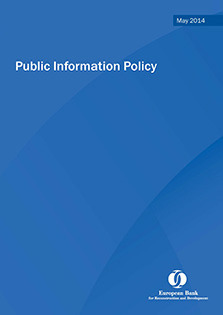 The Public Information Policy (PIP) sets out how the EBRD discloses information and consults with its stakeholders so as to promote better awareness and understanding of its strategies, policies and operations. At the same time, the PIP establishes clear lines of demarcation to distinguish information which is made publicly available (either on a routine basis or upon request) from information which may not be disclosed on the grounds of being confidential. This is to ensure that mutual trust is maintained between the Bank, its business clients and other partners.